Randy C. Gardner is Professor Emeritus from the University of Cincinnati College-Conservatory of Music (CCM), where he was Professor of Horn and Chair of the Winds, Brass, and Percussion Department. During his tenure, he was honored to have received the University of Cincinnati Award for Faculty Excellence and CCM’s Ernest N. Glover Outstanding Teacher Award. Recently retired from CCM, Gardner is an adjunct Artist-In-Residence at Temple University. A successful and dedicated teacher, his students occupy performing and teaching positions throughout the US and abroad. Prior to joining the CCM faculty, Gardner was Second Hornist of The Philadelphia Orchestra for 22 years, under the music directorships of Wolfgang Sawallisch, Riccardo Muti, and Eugene Ormandy. Professor Gardner maintains an active schedule as an orchestral and chamber musician, soloist, and clinician. He performs regularly with the Cincinnati Symphony Orchestra and Philadelphia Orchestra, and he was a long-time member of the Cincinnati Chamber Orchestra. Gardner has also performed as a substitute/extra musician with the orchestras of Boston, Chicago, Cleveland, Colorado, Minnesota, and Pittsburgh. Professor Gardner presents innovative and popular Modular Music Masterclasses, is the author of the acclaimed International Opus publication Mastering the Horn’s Low Register and self-published Good Vibrations: Masterclasses for Brass Players, and composed WHY?! for unaccompanied horn, published by Thompson Edition. He was a performer and co-producer of the Summit Records CD Shared Reflections: The Legacy of Philip Farkas and is featured on D+, a recording in collaboration with trombonist M. Dee Stewart. Gardner has fostered the composition of new works for horn by commissioning compositions and by serving as Chair of the International Horn Society’s Meir Rimon Commissioning Assistance Fund. Works composed for him include Good to Go for horn, oboe, and piano by Douglas Lowry (premiered at the 2008 IHS Symposium in Denver), Quartet for Horns by Randall E. Faust (in memory of Philip Farkas, recorded on the Summit Records CD Shared Reflections), Sonata for Horn and Violoncello by Marcel Farago, Four Random Movements for horn and piano by Larry Wheelock, and Valor for horn choir by Wayne Lu (dedicated to the CCM Esprit de Cor Horn Choir). Among the institutions where Randy Gardner has held faculty positions are Indiana University, Temple University, Trenton State University (now The College of New Jersey), and the New York State Summer School of the Arts. He is a Board member and long-standing faculty member of the Kendall Betts Horn Camp. 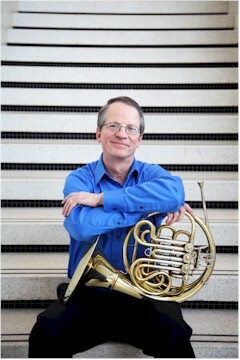 Randy Gardner was a Featured Artist at International Symposia of the International Horn Society in Beijing, China (2000), Lahti, Finland (2002) and Denver, CO (2008). In 2012, he had the distinct honor of performing Schumann’s Konzertstück for Four Horns and Orchestra at IHS Symposium 44 with conductor Barry Tuckwell and fellow hornists Gregory Hustis, Joseph Ognibene, and John Ericson. Gardner also had the great pleasure of performing Kenneth Fuchs’ Canticle to the Sun with the Colorado Symphony Orchestra at the 2008 IHS Symposium. He has been a Contributing Artist at many international and regional horn workshops and he serves as an adjudicator at solo and chamber music competitions. An enthusiastic member of the International Horn Society, Gardner served on the IHS Advisory Council from 1999-2005. In 2018, Randy Gardner was honored to receive the International Horn Society’s Punto Award for his contributions to the horn world. Psychology, sports psychology in particular, has been an area of personal study for many years. In 1999, the University of Cincinnati Faculty Development Council awarded Prof. Gardner a grant for intensive study of principles of sports psychology as applied to music performance. His studies in performance psychology underpin many aspects of his teaching and performing. Randy Gardner’s major horn teachers were Philip Farkas, Christopher Leuba, Ethel Merker, and William Adam. In his free time, Randy enjoys spending time with his family, fishing, hiking, reading, sports, cheering enthusiastically for the Chicago Cubs, church/community activism, and learning.